Weekly Brief is your 1-minute smart and fast report to keep you informed of important Bible-related trends, statistics, articles, and pivotal happenings on the Web and at Bible Gateway. Forward to your friends and share with your followers to encourage them to subscribe. How can the long-ago practices, laws, and rituals of the Old Testament possibly be relevant to our lives now? How are the promises that were made in the Old Testament transformed in Christ? What does it mean that God is the same yesterday, today, and forever? Bible Gateway interviewed Randy Robison about his book, The Age of Promise: Escape the Shadows of the Law to Live in the Light of Christ (Thomas Nelson, 2018). Become a member of Bible Gateway Plus and get immediate 24/7 access to the King James Version Study Bible Notes and other valuable Bible commentaries. Are you struggling to live out your faith in a rapidly changing culture that seems to have lost its way? The ancient book of Daniel speaks of how he survived and thrived in a pagan, permissive, and perverted society. Bible Gateway interviewed O. S. Hawkins about his book, The Daniel Code: Living Out Truth in a Culture That Is Losing Its Way (Thomas Nelson, 2017). Become a member of Bible Gateway Plus and get immediate 24/7 access to the Expositor's Bible Commentary and other valuable Bible commentaries. Browse exclusive discounts on the best Christian books, Bibles, studies, and more! Check every day for the Deal of the Day in the Bible Gateway Store. And sign up to receive our Deal of the Day newsletter! Memorial Day in the USA is May 28. Browse resources regarding the military in the Bible Gateway Store. Browse the Graduation Gift section in the Bible Gateway Store. Father's Day is June 17 in the USA. Browse the Dad's Gift section in the Bible Gateway Store. Britain’s Prince Harry and American actress Meghan Markle were married in St. George’s Chapel in Windsor Castle May 19, 2018 as a global audience of hundreds of millions tuned in to watch. See the Bible passages that were either quoted or referenced during the ceremony. See more Bible-related articles in this week’s Bible News Roundup. See previous editions of Bible News Roundup and Weekly Brief. This summer help your children retain the literacy progress they made during their school-year. To assist teachers, parents, and students, Zonderkidz has created a free 100 Day Bible Reading Plan that runs May 27th through September 3rd. These brief chapter-long Scripture passages are a great way for kids to grow in their faith while keeping up on important reading skills. Browse the Children's section in the Bible Gateway Store. Announcing: Bible Gateway's NEW Bible Audio App with which you can hear as well as read (at the same time) the Bible while on your daily commute, doing household chores, or as you drift off to sleep. Listen and read along with the Bible wherever you have an internet connection. It's free and easy to use! Actress Candace Cameron Bure is the author of Kind is the New Classy: The Power of Living Graciously (Zondervan, 2018). Enter now to possibly win an autographed copy. Read the Bible Gateway Blog guest post by Candace Cameron Bure, One Important Reason Why You Should Be Kind to Everyone. In this guest Blog post on the subject of depression, Hannah Brencher, author of Come Matter Here: Your Invitation to Be Here in a Getting There World (Zondervan, 2018), says, "This is what I needed. I didn’t need someone to stroke my head and pity me for being depressed. I needed someone to tell me to get up and do something. And then do something else. And then something else." Browse the Prayer Resources section in the Bible Gateway Store. Did you know that with the Bible Gateway App you have automatic access to a selection of Bible learning resources, including the NIV Application Commentary and The Bible Panorama? Read this Blog post to see all that you have at your fingertips. Get your questions answered with Bible Gateway’s new Online Bible Learning Program. Get 20% off now! Use coupon code LEARN. Enter every month! This month enter for your chance to win a copy of the NKJV Deluxe Reader’s Bible black imitation leather with slipcase (Thomas Nelson, 2018), which has a suggested retail value of $49.99. Four winners will be selected at random. We've heard from many of you during our year-long 25th anniversary celebration, such as, "Bible Gateway has helped me grow into a deeper spiritual understanding of God's Word." Tell us what Bible Gateway means to you—and tell your friends and followers by using the #MyBibleGateway hashtag to communicate the fun! What if Brokenness Is Just the Beginning of Something Beautiful? Join the In the Middle of the Mess Online Bible Study with Sheila Walsh and get FREE access to all 6 weeks of study videos + other FREE resources. Read the Bible Gateway Blog post, Christian Faith and Mental Health: An Interview with Sheila Walsh. Tell your pastor to visit the new Pastor Resources Page on Bible Gateway. 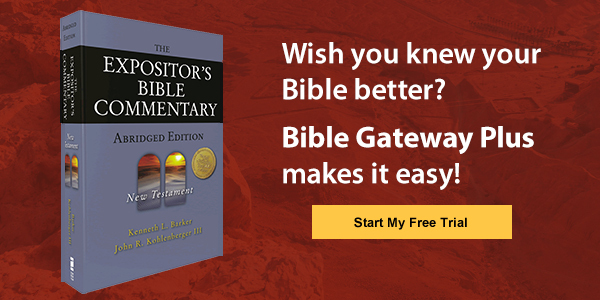 Reading the Bible in multiple languages and multiple versions is always just a click away online at Bible Gateway and in print from the Bible Gateway Store, where you'll save money while supporting the ministry of Bible Gateway when making a purchase.